Over 150 years ago, a grist mill at what is now Summerhill Borough gave Croyle Township its name and its first industry. However, its founder, Thomas Croyle, lived long enough to see that area cut from its parent, Summerhill Township, in 1858. Croyle came into the section in 1801, just a year after the original settler, James Cane. In 1802, the husky Croyle hewed lumber for his grist mill from the broad expanses of oak, chestnut, and pine timber which stood over the entire district. For many years, the miller and his family wre the only residents of Summerhill, now situated near the center of the township. His energy at his chosen profession and in civic affairs apparently gave him longevity. He was the moving spirit and his mill the hub of activity until his death in 1858 at the ripe old age of 98. From the Croyles and other early families, close ties with neighboring South Fork Borough and Summerhill Township were welded. The Croyles inter-married with the Stinemans and the family branches out into what is now South Fork. Farming, logging, and mining provided the economy on which the township and its thrived. Today the residents still use these God given elements as the basis for enterprise. To Joseph Croyle, grandson of the township patriach, goes the credit for opening the area to mining. In 1873, he is reported to have leased a mine on his 240 acre tract in the western part of the townshp to the South Fork Coal and Iron Company. He served as the firm's superintendent for six years and was a principal stockholder. This, historians say, was the first mine in the South Fork area. Building of the Allegheny-Portage Railway about 1830 and later the Pennsylvania Railroad gave impetus to mining and logging. An influx of Irish and German immigrants about the mid-point of the 19th Century hastened the growth of the township. The village of New Germany became the center for farming and lumbering. Ehrenfeld was built by those developing the coal. Growth ws evident throughout the township, there were about 9000 residents in 1890 as compared with 3.347 in 1950. As the forests gave way to mines, farms, roads and homes, churches and schools entered the picture. Their growth was in keeping with that of commerce. Today the area boasts a fine joint school system, South Fork-Croyle Joint School System. The township is bounded on the north by Cambria Township, on the south by Adams Township, on the east by Summerhill Township, and on the west by Adams and Jackson Township. The South Fork of the Conemaugh River forms part of the western boundary as do the ruins of the old South Fork Dam. 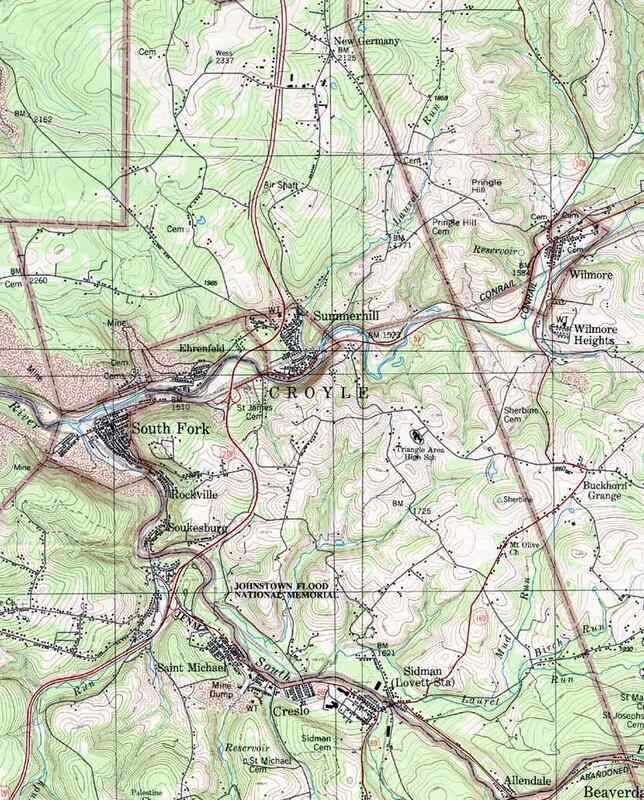 The main stream of the Conemaugh River also traverses the township from east to west.